Think about your favourite game. How attached were you to the story and its characters? In most games you know who the bad guys are, and the choices you make are often clear-cut. Most of the time it’s about you against them, good versus evil, the “heroes” beating the “villains”. But what happens when you’re in a game in which there are no villains, set in a place so plain and ordinary, and that the people – or the “heroes” – involved are just normal people like yourself, who have to deal with mundane things and interact with unexciting characters? The Novelist is set in a summer home, temporarily inhabited by the Kaplan family: Dan , his wife Linda, and their son Tommy. Dan and Linda have decided that going away for the summer will give them the fresh start that they need to face their own problems, reach their own goals, and to be closer to each other and their son. What the family does not know is that the house already has a resident: you. 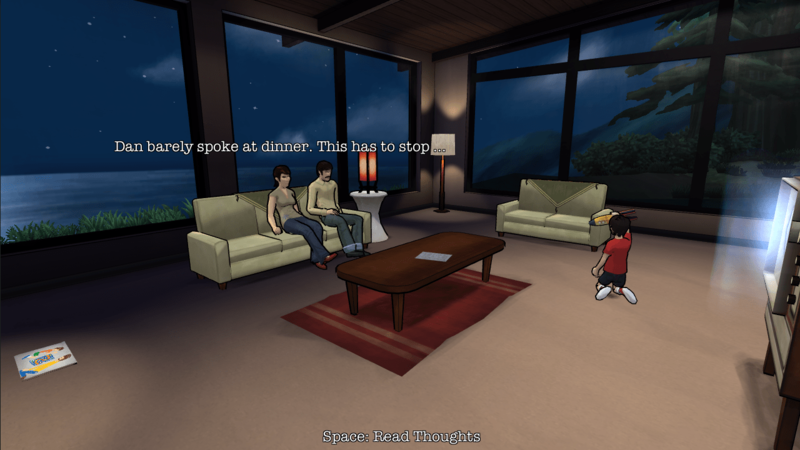 You play as a ghost who has the power to influence Dan’s decisions. You have to spy on the Kaplans, read their thoughts, search their memories and go through their personal things in order to figure out what each family member wants. You will then choose what’s best for them. Ultimately, it is you who gets to decide their fates. At first glance, the game’s graphics may seem simplistic. The characters’ faces are barely detailed – they look like could be anyone and anybody. Each room in the house is somewhat bare and devoid of clutter – you can tell that the Kaplans are not rooted in this place. Even the house’s surroundings look a little bit washed out, unassuming and irrelevant. Honestly, I don’t mind the simplicity. Nothing in the visuals can distract you from the core goal of this game. The non-linearity of this game’s storyline boosts its replay value. Different choices result in different consequences, and the compromises you choose vary in each chapter of each instance of the game. Very early on you will realize that you can’t please everyone, and that you have to choose according to what you decide the family’s priorities should be. I recommend that you play this game more than once. Explore the different situations and outcomes characters can end up in. You may find yourself too attached to one of them but deeply sympathetic to another and so some decisions you make will prove to be disastrous to at least one of them. It does not matter; you still have to choose. 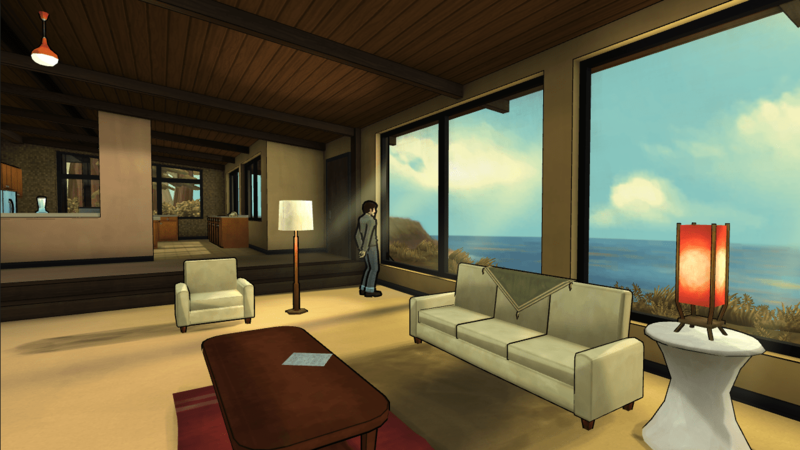 The Novelist is a game that I finished playing in just under three hours. I’m afraid I’ve grown attached to the Kaplan family, but I’ve doomed them into a lifetime of failed career and life choices. Yet I want to play this game over and over again, just to see the different possibilities and outcomes that might result if I choose differently. But let’s face it: this game is not really about the Kaplans. This game about you – the ghost – and how much of your own values and priorities in life are reflected in the choices that you make within the game. Images taken from The Novelist press kit.